I’m new to band saws and looking for a suggestion on how to solve this problem. I’m trying to split/resaw a foot-long 1-1/2” x 3-1/2” board into two 3/4” x 3-1/2” x 1’ on a band saw. 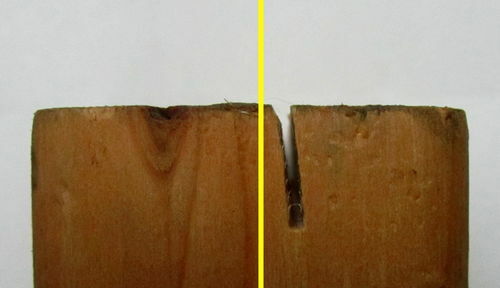 As soon as I start the cut the blade turns away from the fence entering the board at an angle and then in a second I smell burned wood, see smoke and then the blade may bind. On the photo below, the yellow line is parallel to the fence, the cut is angled away from fence. The cut height is 3-1/2”. I assume the blade is still sharp because it had only been used for a few minutes before. The blade tracks in the middle at the crest. The guides are 1/4” above the board. Should I try tensioning the blade up to the 3/4” mark or more? Or does this have anything to do with drift angle? I would appreciate any suggestion on what else could be done here. Thanks and best wishes, h.
First off, ignore the tension markings on your machine… those are there to get you in the ballpark only. Secondly, have you watched the obligatory band saw tune up video? When I finally broke down a bought a proper ‘tension gauge’ I was surprised how under tension my blade was – yet I was using the chart and the marks that came with my bandsaw. Grab some scrap wood and a day and get to work AFTER you watch the Snodgrass video. Do exactly what he says as each and every step done correctly helps to eliminate problems. I am a relative novice also. More than any other tool I find that a BS is like a nervous system. You have a limp but it could be caused by a pulled muscle, a pinched nerve in your back or a brain tumor or any number of things which can cause any number of other things to be impacted. The flutter test is good but it is still subjective. After EVERYTHING is adjusted per Snodgrass try turning that tension up incrementally and testing it until it sounds like it’s slowing the motor. You might be surprised at how tight it’s supposed to be as John H said above. Bsaws are wonderful when they work but are a true PITA when they don’t. Like I said, get a bunch of scrap and set aside a whole day. Don’t even think about resawing until everything else is working perfectly. I was so happy with my delta turning out so well, i did the same to the cheapo HF 14’’ unit, while it took a lot more effort, i did get it to where i can resaw up to 3/16’’ in a decent straight line, takes patience, but it will come about. good luck,nothing like a tuned band saw. The best I was able to do only let me hear accordions. Thanks for the responses! Well, I’ve set up the saw once again following the video—nothing changed. 1” cuts are okay; the 3-1/2” cuts fail miserably. Using “flutter” test I tensioned the blade until it stopped “fluttering” and then added an extra turn as suggested by the manufacturer but when cutting the blade still entered 3” boards at a shallow angle and didn’t straighten up until it bound. I kept increasing the tension until the blade has changed tracking and started hitting the aluminum blade guard. I re-checked and, yes, changing the tension changes the tracking of the blade—who knew! Will see if anything else could be done here (after I get a new blade). Can I continue tensioning and adjusting the tracking? What breaks first, the band saw or the blade? The tensioning knob is getting hard to turn. The guides on the right side wear pretty quickly. The blade twists and files down the coners. Bsaws are wonderful when they work but are a true PITA when they don t.
Yes, kind of frustrating; this is a new 14” Jet and I haven’t been able to cut anything so far. I kept increasing the tension until the blade changed tracking and started hitting the aluminum blade guard. I re-checked and, yes, changing the tension changes the tracking of the blade—who knew! Something is not right with your machine… increasing tension should not alter tracking, and a blade rubbing against a guide block will not ‘file down the corners’ unless you have the teeth hitting it (which would also ruin your blade and cause it to pull to one side like you mention). just barely touches and rotate the wheel. If the tires are lumpy this can be corrected. What kind of saw do you have? This is JET JWBS-14CS. The one that comes in two boxes. Something is not right with your machine… increasing tension should not alter tracking, and a blade rubbing against a guide block will not file down the corners unless you have the teeth hitting it (which would also ruin your blade and cause it to pull to one side like you mention). Tension did change tracking on this saw: increasing the tension moved the blade forward, decreasing moved it back. When I tensioned the blade well above the 3/4 mark on the scale, the blade was about to slip off the wheel. 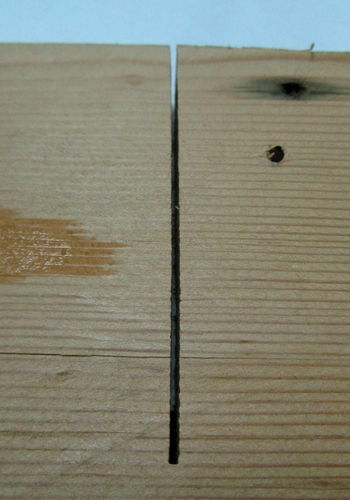 The blade twists as soon as it touches the wood and enters at an angle. 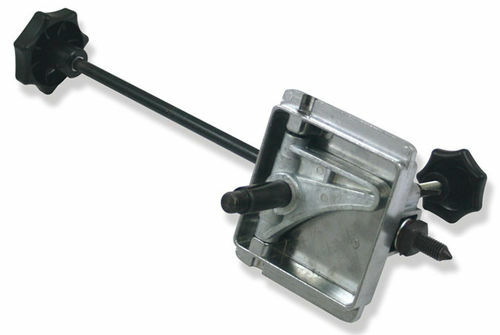 Check your upper wheel pivot bracket… sounds like it’s either bent or broken. How old is the saw? The casting for the upper wheel adjustment sounds like it may have broken. Take the blade off and remove the upper wheel, I will bet the hinge is cracked. My blade always tried to pull the board away from the fence, if that makes sense. Angling through the workpiece. I eventually determined it was due to drift angle, and adjusted my fence to align with the natural drift instead of square to the blade. This was with a 3tpi 1” resaw blade sawing 12” diameter cherry logs into boards. HOWEVER it may be something else, I’m fairly new to the BS too, I know there a lot of variables that can be adjusted. Check your upper wheel pivot bracket… sounds like it s either bent or broken. Do “upper wheel pivot bracket” and “upper wheel hinge” mean this thing?